Oh man, did I hit jackpot on this one. I am addicted to the savory, bittersweet flavor of bok choy and Asian style dishes are my absolute favorite. I was brainstorming at work today what I could make tonight using the rest of the bok choy and whatever other veggies were left in my fridge. After some light deliberation between emails and phone calls, it was decided that the ‘choy will marry with the Quorn Naked Chik’n Cutlets. These have a good texture and taste. A couple of weekends ago, I put them on a toasted hoagie with loads of Organicville Barbecue sauce and pickles. I was in faux fast food heaven. 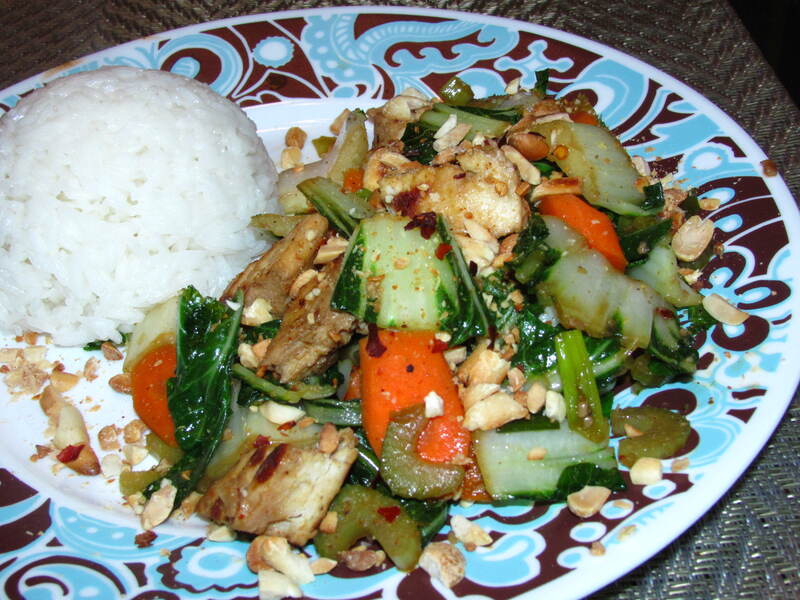 As for the bok choy dish here, the roasted peanuts top this dinner off perfectly. This one’s a keeper! Begin by heating an indoor grill (like a George Foreman Grill) on low to medium heat. Brush the Quorn cutlets with olive oil. This oil is separate from the oil you will use for the rest of the recipe. Grill until grill marks are present. Thoroughly coating the cutlets in oil allows them to cook best, otherwise the areas not coated in oil will be dry. Heat 1 tbsp oil in a medium skillet on medium heat. Add carrots, garlic, black pepper to taste and ground ginger. Stir to coat evenly. Once carrots begin to become fragrant, add green onion and bok choy. Once the bok choy is added, keep the heat on medium until you notice the bok choy is slightly starting to wilt. Reduce heat to medium low and add the soy sauce and vegetable broth. This will keep the boy choy from becoming too soggy too soon. Once chik’n cutlets have cooled somewhat, carefully (because they’re hot) transfer them to the cutting board and slice into strips, then into chunks. Add to the pan with everything else and stir fry until bok choy is wilted and carrots are fully cooked. Use the other 1 tbsp of oil for your jasmine rice that will be cooked on the stovetop. Follow package directions to cook rice. Adding oil keeps the rice from sticking to the pot so badly and from sticking to itself. Garnish with crushed peanuts. Makes 2 really big, tasty servings! Looks fantastic, even better since bok choi is in season!